Disadvantages: Due to trademarks very “generic” machines! Most of the time we see modern modelers displaying an engine change or other major operation involving heavy maintenance it is shown under field conditions. But in the real world most of that sort of work is done under what the US Army calls “Third Shop” or depot level maintenance and the Soviets or Russians call capital rebuilding. These are generally large workshops someplace in either garrison or rear areas where all tools and facilities are available for that purpose. 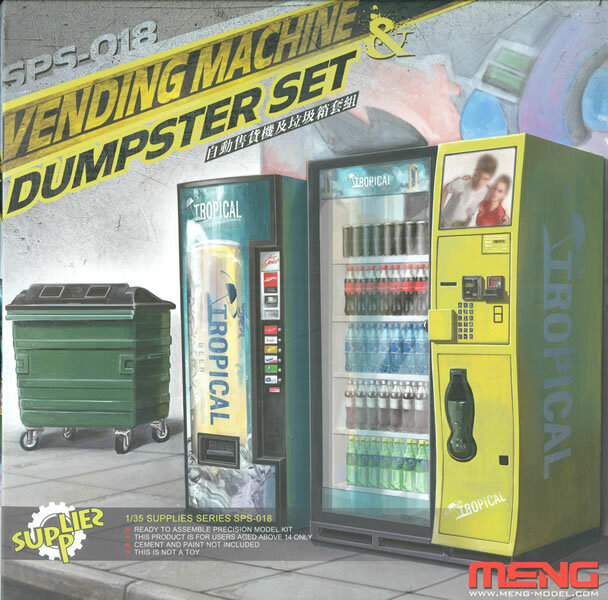 Also common to those facilities are drink or soda machines and dumpsters for discarded parts and boxes. Now Meng has released a handy kit of those details which fits the bill. They have provided two types of vending machines - one with a glass front showing the remaining brands of drinks available and one with a cabinet type where you select and press a button. The first one consists of four shelves with two rows of bottles or cans in each one - the bottom three are clear styrene parts and the top one are grey. No decals or markings are provided so it is up to the modeler to “brand” them on his own. The kit does provide markings for “Tropical” which is the apparent vendor of the beverages. Note that in this day and age retailers are fiercely protective of trademarks so any attempt to use Coke or Pepsi (or other major brands) would be met by a demand for royalties, so Meng took “Option B” and left it generic. The second machine consists of only three parts - front, base and body. It comes with a large cheery logo wrap on the front but once again shows no branding of the products offered. The dumpster consists of a three-piece body, four casters and a plastic top. These are quite common and are seen in a number of locations albeit it does look more European than American in general design. US ones tend to be galvanized steel with that silver-grey finish used on buckets, tubs and other items generally filled with water. The top may be flipped back (since it is lightweight plastic it just has a simple hinge at the rear and no locks. There are some ejector pin marks to remove but happily Meng has designed its alignment tabs as “no show” so pin and nesting marks do not need to be removed. Overall this is a neat idea and would be a nice addition to mechs tearing down an Abrams or Stryker for repairs.